When I was little, I watched my older brother draw comics and build empires with LEGOs. I wanted to do everything that he did. Part of that was me being the annoying, copycat, little sister, but there were some innate strengths at play too. My dad is artistically inclined; he would sit at the kitchen table and doodle cartoons on scraps of paper. My mom is more logic-minded; she’s the musician and mathematician and has a talent for solving puzzles. And yet, as I advanced through school, I avoided both of those paths. Artists starve, as do architects. Business was a no-go, as economics was equally boring and slightly beyond my grasp. Psychology would require extensive schooling to have my own little practice, including horn-rimmed glasses and a leather-and-oak office. Engineering and architecture mean high-level math (that shrieking? it’s me). So much math in that computer! In my current position – a combination of university teaching and administration – I’ve started to rediscover my strengths. The old artistic sense returned, and I’ve spent some time making event posters and course trailers (like movie trailers, but for college classes!). While I never became an engineer or architect, buying a house has encourage me to plan and build on scales I never imagined. And one positive from my military service translated over to my new job: I understand that clearly written policy is part of the foundation of any organization, and I am capable of creating whole manuals full of the stuff. These realizations didn’t happen overnight. I didn’t even consciously think about them. Rather, I was reading an article about tapping into strengths at work. For much of my life, I’ve been doing just as the author warns against – undervaluing my strengths. I’ve been so focused on challenging myself, putting myself in uncomfortable situations to force growth, that I had convinced myself I had no innate strengths. What seems obvious to you, but other people do not seem to “get” it? I’m a reader and always looking for signs or directions. Many other people don’t even seem to notice those same signs. I have a natural drive to figure out how things work and explain that to others – hence, writing manuals. What projects (or parts of projects) have netted you compliments? Designing event posters was part of my job from the beginning, but then someone approach me to make flyers for upcoming courses. Soon, faculty members and students were streaming by my desk with compliments and requests for more. Listening to the audiobook version of Jeff VanderMeer’s Annihilation filled my head with fantasies of going back to school to study biology. The protagonist, a biologist, found her passion by studying the transition of ponds, as humanity leaves and nature takes over. I could picture myself doing the same. But then I stepped back from the dream and really thought about what that would entail. Huge lecture halls filled with students at least ten years my junior. Days filled with science, a subject I’ve never found particularly easy. And what would I do with a spare Bachelors degree? Nothing in my long-term plans aligned with it. For now, at least, I’ll just sit by my own pond and observe. 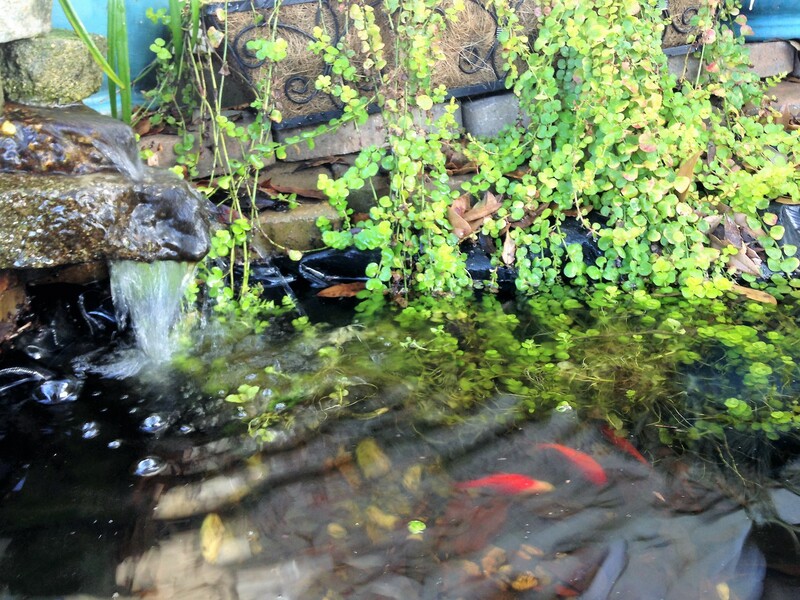 Oh man, the first iteration of my pond was so lush. Those fish would be duck food now. Skills at which we’re naturally strong might seem easy. Therefore, this idea of refocusing on strengths might seem counter-intuitive to the path of hard work. It’s not. Rather, strength and hard work can work in tandem. Strength: I’m good at organizing, so I planned a garden for my front yard. Hard Work: I built the garden by hand, rather than hire someone else to it. The last time you felt truly at peace, what were you doing? Where were you? Who were you with? I felt deeply at peace during my morning run through the park. This reflects my values of: being in nature, exercise/pushing myself physically, and solitude (I run at a time when most people are just waking up). If you were on the cover of a magazine, what would be the achievement that brought you there? Choosing one thing might be difficult, but it’s okay to have two or more. Even a general sense will help you. Many of the things that come to my mind, for example, involve creation and making things with my own two hands. Hard work is, by its nature, meant to be challenging, but there’s a difference between hard work counter to your values or strengths (or involving something that you just don’t care about) and pushing yourself on a project that embodies your values. During my time in the military, I was constantly doing the former, and I was absolutely miserable. I dreaded work every single day. On the opposite end, the garden project has me almost gleefully outside in the early morning hours before work, bent over and pulling weeds. On weekends, I can’t wait to wake up and haul bags of rocks or stain my fence because I’m tapping into my values and strengths. One of the beautiful things about the value-strength-work triad is that by working hard toward your values, you might discover or develop new or less predominant strengths. If you consciously choose projects that align with the triad, you’ll naturally curate a very satisfying life. It might take a long time – but that’s part of the hard work.